I have also adapted this session for Pedagoo South West and a 45 minute version of the 90 minute session can be found by clicking this link, along with the video of the session on YouTube. I chose that photo on purpose. And by “our”, of course I mean peer and teacher feedback, since Berger’s example is primarily focused on teacher-mediated peer feedback. To demonstrate this, I ask colleagues to undertake a public critique exercise (inspired in part by the Alan Partridge clip used by Tait Coles at TeachMeet Clevedon). I ask staff to produce something to a set of criteria – a haiku, in the Prezi example – and submit it for public critique using Tait Coles’ critique sheets. I have adapted them so that there is space at the top measured for post-it notes to fit into – because I’m obsessive like that. You can download the Public Critique Sheet here. A key component of Triple Impact Marking is DIRT – Dedicated Improvement and Reflection Time. 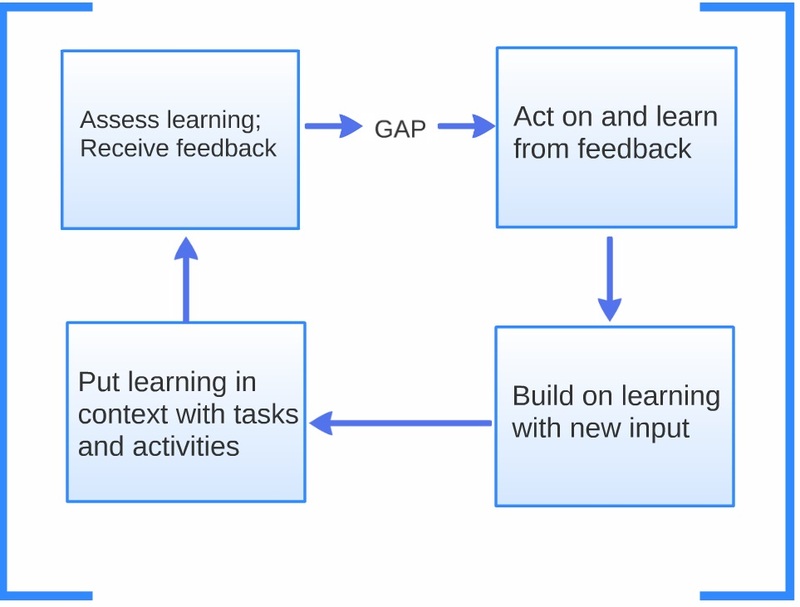 Alex Quigley explains the concept in detail (with links) here, but essentially students need TIME to act on the feedback given. This is where the gap is closed. 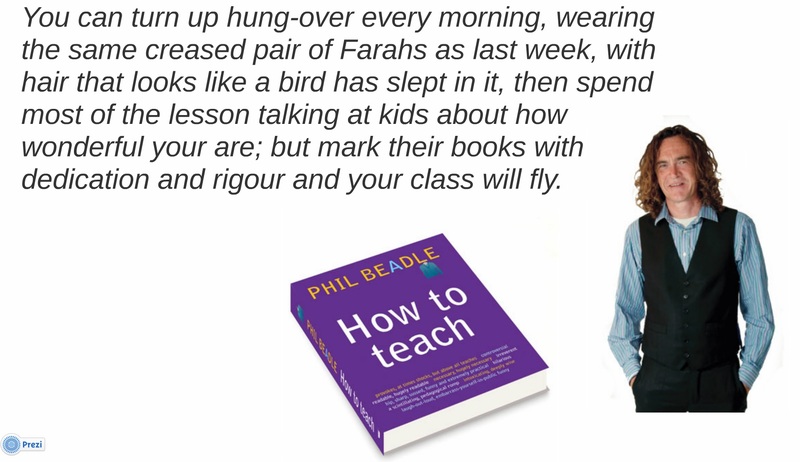 I have been as guilty as any teacher of handing back meticulously marked books, asked my class to read the comments, and then got on with the next bit of the course. What. A. Waste. Well no more – we’re getting DIRTy. This emphasises the importance of creating a successful feedback culture to enable a growth mindset. No grades. No levels. Specific targeted feedback, hard on the content, soft on the person. To conclude the session, an exercise looking at managing marking workload. Many of these ideas come from another excellent Mark Miller blog, found here. There are twelve strategies and staff note down the advantages and disadvantages of each strategy in terms of learning and performance gains and workload implications. The idea is to evaluate each strategy in terms of its overall cost benefit to the busy classroom professional. What has become clear to me in planning this inset is how rich my personal learning network is. The blogosphere is teeming with great ideas about marking, feedback and critique – all I had to do was synthesise the great work of others and stitch it into a package that will fit into 90 minutes of a dark, January evening. I hope it will go well! An excellent blog. There are so many new, innovative and effective ideas around, I’m trialling RAG123 by @KevLister with weekly dirt tasks. Working a treat so far. I’m writing a blog as we speak. I’m trying to incorporate symbols for dirt tasks to save even more time (but still having the same action by the pupils). 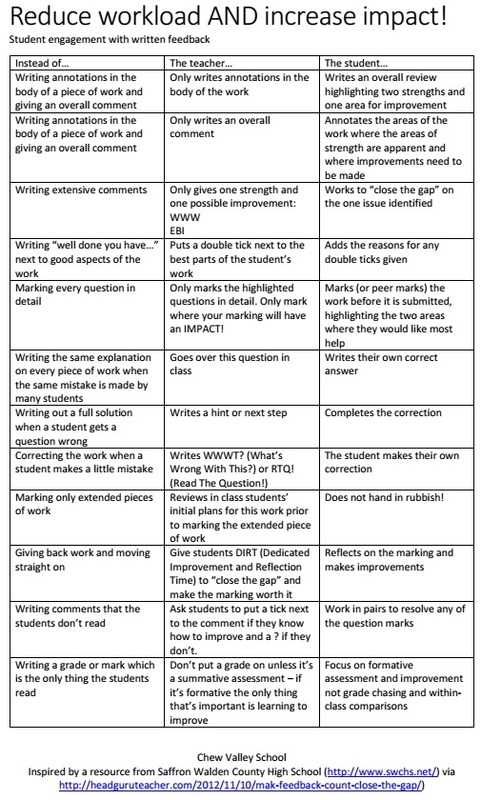 More brilliant stuff on improving marking. This is my current area of interest. Really enjoyed this one. Great post Chris and your right about PLN. You have summarised all the posts I have been reading recently. 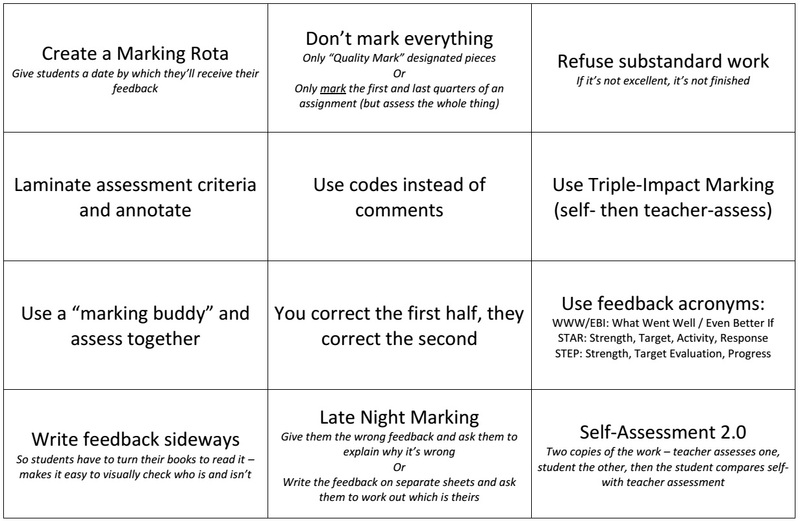 Fantastic summary – great for sharing with colleagues!